Paris (AFP) – One of the biggest gambles in space history comes to a climax on Wednesday when Europe attempts to make the first-ever landing on a comet. Speeding towards the Sun at 65,000 kilometres (40,600 miles) per hour, a lab called Philae will detach from its mothership Rosetta, heading for a deep-space rendezvous laden with risk. The 100-kilogram (220-pound) probe will seek out a minuscule landing site on the treacherous surface of an object darker than coal, half a billion kilometres (300 million miles) from home. “It’s not going to be an easy business,” was the understated prediction of Philippe Gaudon of France’s National Centre for Space (CNES) as the mission prepared to enter countdown mode. The stakes facing Rosetta managers in Darmstadt, Germany are daunting as the 1.3-billion-euro ($1.61-billion) project reaches a peak. Two decades of work have been poured into what could be a crowning moment in space exploration. The goal: the first laboratory research into the primeval matter of the Solar System — ancient ice and dust that, some experts believe, may have helped to sow life on Earth itself. According to this theory, comets pounded the fledgling Earth 4.6 billion years ago, providing it with complex organic carbon molecules and precious water. Rosetta has already sent home fascinating data on the comet, but Philae will provide the first boots-on-the-ground assessment, using 10 instruments to study the comet’s physical and chemical composition. Like Rosetta, it will wield a mass spectrometer, a high-tech tool to analyse a sample’s chemical signature, aimed at drawing up a complete carbon inventory. The showstopper find would be molecules known as left-handed amino acids, the European Space Agency (ESA) says. “These are the ‘bricks’ with which all proteins on Earth are built,” it says. 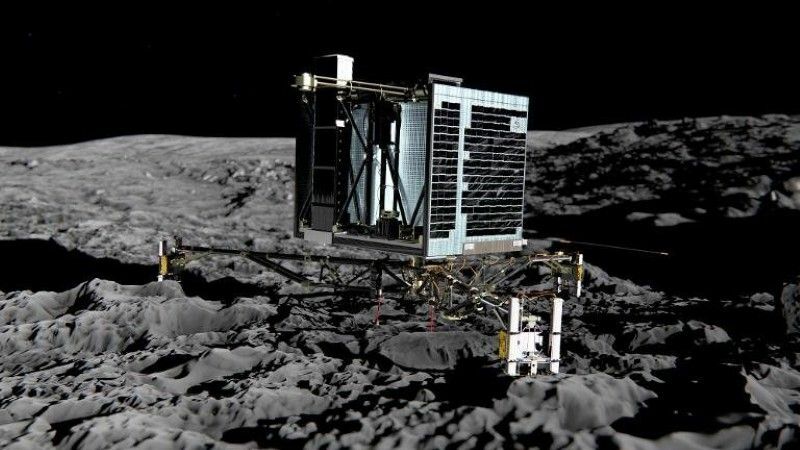 But getting Philae into position will be a white-knuckle ride. After its launch in 2004, Rosetta spent 10 years zig-zagging around Earth and Mars, using the planets’ gravitational pull as a slingshot to build up speed to reach its prey, Comet 67P/Churyumov-Gerasimenko. But when Rosetta finally caught up with it in August, it witnessed a sight that caused despondency back on Earth. Far from being a simple potato shape, “67P” turned out be two gnarled lobes about four km across joined by a narrow neck. It looked like an super-dark rubber duck, ravaged by aeons in orbit, turning slowly in space. Its surface was a nightmare of crests and gullies, studded with hundreds of rocks as high as 50 metres (165 feet) and wicked slopes with an incline greater than 30 degrees. This was a huge, unexpected problem, said Francis Rocard, a French astrophysicist. “It took a billion calculations to find a decent landing site” — one offering a fair chance that Philae could survive and meet scientific goals, he said. If final “go/no-go” assessments give the green light, Philae will separate from Rosetta about 20 kilometres (12 miles) from the comet at 0835 GMT on Wednesday. “Then it’s a very gentle freefall for the next seven hours,” said Sylvain Lodiot, in charge of flight operations. After that comes the hard bit. No one knows what a comet’s surface is like. Is it hard and crusty, like a shell? Crumbly? Slippery? Is it brittle — will it crack, causing Philae to sink into some fudgy or spongey substance below? Seeking to cover all the possibilities, Philae’s designers have equipped the lander with three outstretched legs designed to dampen the impact. When the lab touches down, it will fire two harpoons to secure it to what — hopefully — will be a robust surface, while a thruster on top of the lander will fire to cancel out bounce. Ice screws in the lander feet will deploy for extra grip. The chances of success? “Seventy percent,” said Gaudon, admitting to days of doubt that the chances were much better than one in two. “We need to be lucky,” added Andrea Accomazzo, flight director. And only then can Philae start its real mission of analysing the makeup of the comet. Batteries will be enough to keep the probe going for 60 hours, but recharging from sunlight “could keep us going until March,” said Rocard.